Obverse: Draped bust of Agrippina right, wearing hair in long plait. Text around AGRIPPINA M F GERMANICI CAESARIS. Reverse: Carpentum with six spokes in wheel drawn left by two mules, the cover supported by standing figure Caryatides on the four corners, and with ornamented side panels. Text SPQR above, and in two lines in left field MEMORIAE / AGRIPPINAE. History: Agrippina Senior was born in 15 BC and was the wife of Germanicus and mother of Caligula and Agrippina Junior. She married Germanicus and accompanied her devoted husband on all his military campaigns. She was banished by Tiberius in 29 A.D. and died of starvation four years later. The use of a carpentum was a great honour granted as a special privilege to females of the imperial family. 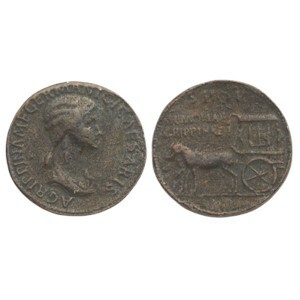 This coin was struck in honour of Agrippina Senior after her death. When Caligula instituted games and other solemnities in honour of his deceased mother Agrippina, her carpentum went in the procession.